Greetings on this last day of January - it's amazing how quickly the month flew by! 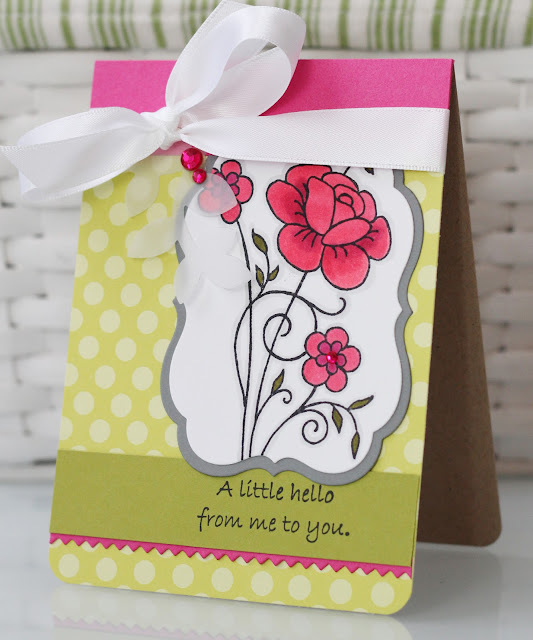 Today, I am sharing another creation using some wonderful Great Impressions Stamps. I think you will enjoy this sweet image and sentiment. They were such a joy to work with! Hope you are having a great week, and are looking forward to SuperBowl! Today is a very exciting day for me and my family... we are signing the paperwork and purchasing our first home! Because of the move my card today is was a "limited supply challenge"... most of my cardstock, paper, ribbon, and stamps are all packed up and ready to move to the new house. But I managed to pull out some fun bright colors (the same colors as last week... I loved the green/pink combo! ), a cute as a button frog stamp, and a few simple embellishments. I didn't include a sentiment because the focal image and dies take up a lot of room, but I will add a sentiment to the inside of the card when I'm ready to mail it. And don't forget about this month's challenge! It's a sketch challenge and one participant will be chosen to be a guest designer for Great Impressions Stamps! You can get all the details here. Valentines Day and create a more "manly" but yet cute Valentine. (If there is such a thing) lol! 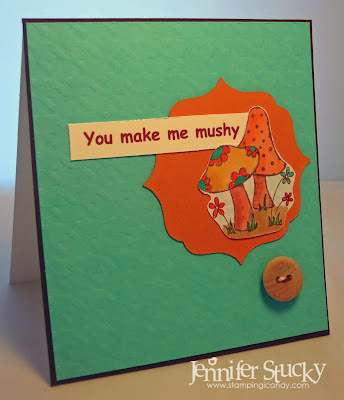 These mushrooms have just the right touch of whimsy for a puny card. to color up! The sentiment is computer generated and totally gives me the giggles! Just a few more days until our challenge is over for the month. So get in while you can! A new challenge will begin this Sunday. And...don't forget about our sale going on at our store. Hello! This is Cheryl from Shestamps. I’m “gearing” up for Valentine’s Day. Today I’m sharing a card I made using the stamp “Bike Built for Two” (E697) from Great Impressions Stamps. I think I am going to give this to my DH on Valentine’s day. He loves to race mountain bikes, so I thought the bike theme might be perfect for him. What do you think? Who would you like to ride a bike built for two with? Have a fabulous day! Thank you for stopping by! Yes, I have a confession.......... I ordered these darling little stamps to give away for blog candy...and the longer I looked at them, the more I couldn't bear to part with them. Finally-I ripped open that package and stamped them up for this project! But lucky for you- I have my sources LOL...I have another set of these darling stamps to offer as blog candy! Here's a tip---this little penguin stamps nicely with Versafine Black ink-you get a wonderful nice dark black penguin body with it. I carefully colored the feet and nose with a copic marker as Versafine can smear with copics. I added the little penguins onto a colorful Heart Treat Box that I cut with my Silhouette. Yep-just stuck them on with a pop dot along with the stamped sentiment tag too. Very simple. I like simple...and cute! I also cut several easels with my Silhouette-making it easy to display them. Wouldn't it be fun to find one of these cuties on your desk on Valentines Day? To win these cute stamps, just leave a comment here and/or on my blog (yes you get two chances if you hit both places) before next Saturday's Jammie Day Saturday! Good Luck!!! Please take a few minutes to check out our monthly challenge ! There is a sale going on at Great Impressions Stamps-10% off and free shipping with purchase of $25 through February 14th. (coupon code Love)-don't miss out!!! As it's Thursday, it's my day to post, here at the Great Impressions Stamps Blog. Today, I am sharing a couple of stamps from the December Stamps of the Month. The first thing I do each morning, is stumble to the coffee pot, so this stamp really called out to me! The 'coffee' was embellished with a bit of Glossy Accents, making it look a bit more realistic. putting one line on the front, and the rest on the inside. You still have several days to join in on the January Sketch Challenge! 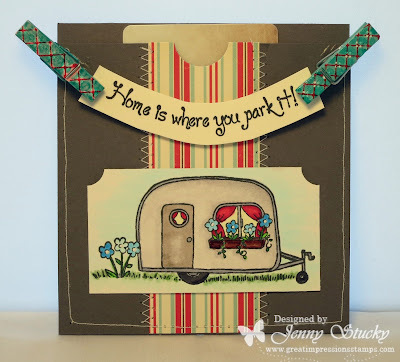 Hope to see your card linked up there - you could win a spot as the next Guest Designer! Great Impressions E777 "Only as Strong"
Great Impressions F537 "Steaming Cups"
Good morning! 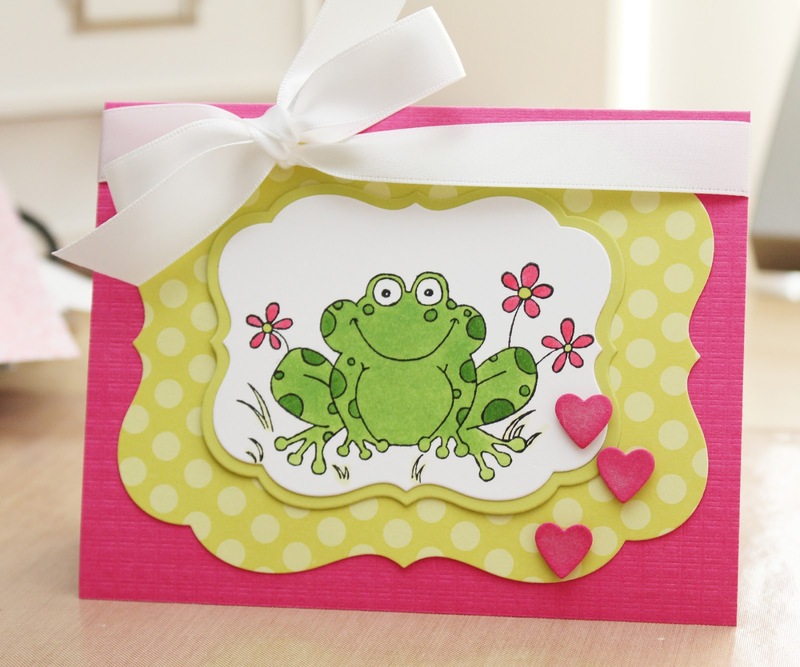 I hope you all enjoyed hopping along to the Great Impressions Stamps and Paper Crafts Facebook pages yesterday. The Little Trailer stamp is so fun to stamp with! For today's card I used a new stamp by Great Impressions: Floral Bouquet. I used Copic markers to color the flowers and leaves, and I used a light gray Copic marker to outline the entire image. follow the path I set for you today. forces today and tomorrow with a Facebook Giveaway! our latest release available on the web! I created a gift card holder for a friend who is moving with this fun image. Here are all the deets to qualify for a chance to win! 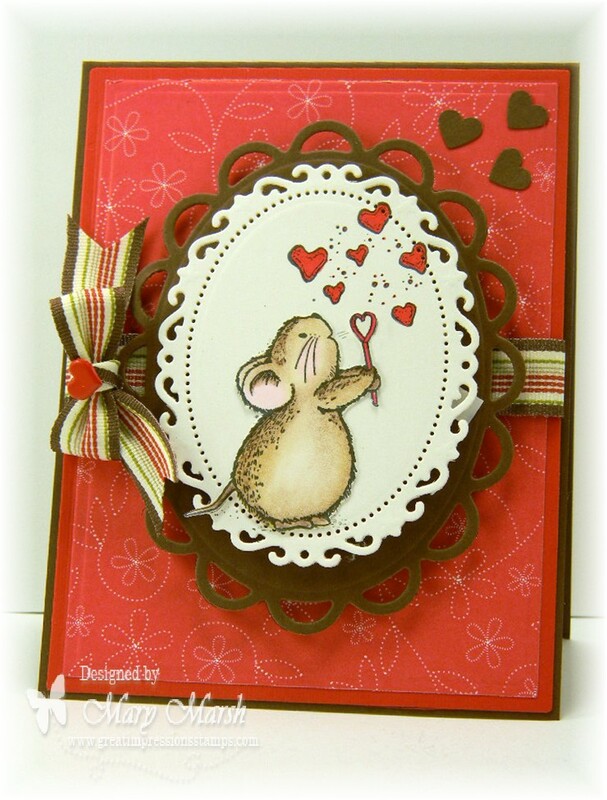 Hop on over to the Papercrafts Magazine Facebook page. Check out the photo Susan Opel posted with cards made from our very own designers Erin and Cheryl. Tell us what you think in a comment. Next stroll on over to the Great Impressions Stamps Facebook page, "Like" us and leave another comment. That's all there is to it! Three random winners will be chosen from comments left on both Facebook pages. You have all day today and tomorrow to qualify. There is still plenty of time to get inky with our monthly challenge. Details are here. Hi! This is Cheryl from Shestamps. Today I’m sharing a card that I made using Help From Your Friends (G78). Aren’t these critters cute? I decided to use some nice, warm colors and move away from using red. With Christmas and Valentine’s Day, I feel like I have been using red on almost every project lately. I couldn’t quite get the colors correct in the photo. The mat, “Hi” and ribbon are all a warm grey that coordinates with the DP. They look slightly olive on my screen. I didn’t have quite the right color ribbon, so I colored it with my Copic markers so that it coordinated better. I hope this brightens your day a bit. Thank you for stopping by! Hello There....Welcome to Jammie Day Saturday-my favorite day of the week! I told you last week that I had another Valentine card to show you today-so here it is! You know I love my Great Impressions meece-this one is having a great time blowing heart bubbles. I cut a pretty heart border with my Silhouette (a freebie from Birds Cards) and added it to the top of the card with a silky red bow. Both the image and the sentiment are up on pop dots for a little added dimension. Again-I used my pretty new Authentique Lovely DP . I love all the letters on the background paper-if you look real close you will find the hidden sentiments. I do wish you all a most wonderful weekend! Please take a few minutes to check out our monthly challenge on the Great Impressions blog ! See you again soon!